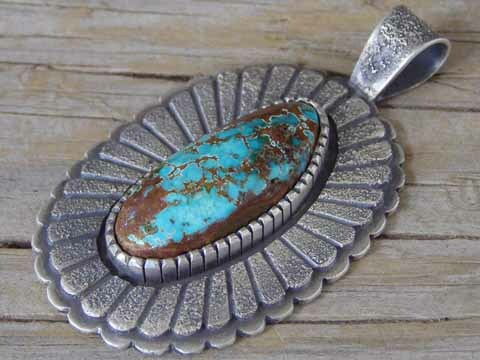 This pendant is set with a large free-form stone of natural, untreated Pilot Mountain turquoise from Nevada. It is set in a heavy-gauge, handmade serrated bezel surrounded by stylized radiating eagle feathers. The surface of the silverwork is stippled, including the fixed bale at top which has an opening of 6 mm. Beautifully made in a nice Traditional Revival style with just the right patina! Hallmarked FRANCIS and stamped Sterling on back. Stone: 1 3/8" x 9/16"
Dimensions of pendant (excluding bale): 2 1/8" x 1 9/16"